When Baby Hippo can't sleep he goes for a wander through the reeds and along the bog and over the rocks and through the willowy, wavy grass. On the way he discovers that all the mums and dads are hushing their babies to sleep. "A story filled with movement and physical affection. The lap-sit audience will love the squishy, lumpy sounds and the repetition of the text as they point to the animals in the clear, bright pictures." --Booklist on Kiss, Kiss! Award-winning picture book writer Margaret Wild has published successfully all over the world and has been translated into many languages. Well known for titles such as Lucy Goosey and Kiss, Kiss!, she is admired for her sensitive handling of difficult topics as well as her lively, playful texts for preschoolers. 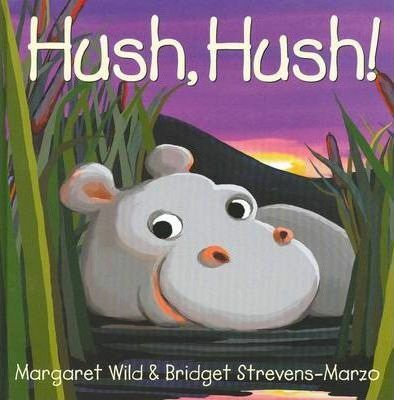 Based in France, Bridget Strevens-Marzo's recent titles with Little Hare Books include the delightful pre-school romp This Dog Bruce (by Frances Watts), Daddy Does the Cha Cha Cha (by David Bedford) and Bridget's Book of Nursery Rhymes.